Features precision digital thermometer for determining heat of hydration of cements by measuring difference between heat of solution of dry cement and heat of solution of a separate sample partially hydrated for 7 to 28 days. Constant-speed stirrer maintains uniform temperature throughout liquid and supplies sufficient agitation to keep solid reactant suspended in the acid mixture. Includes insulated wood case, insulated 1G (3.8L) can; 1 pt. (0.47L) vacuum jar with stopper; 2-channel, Precision Digital Thermometer; plastic funnel; stirring paddle and chuck; geared synchronous motor. 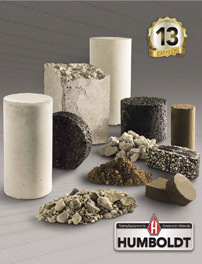 ASTM-compliant mixer for mixing hydraulic cement pastes and mortars of plastic consistency.